Dr. Al Siebert was founder and director of The Resiliency Center. He was internationally recognized for his pioneering research into the inner nature of highly resilient survivors. His best-selling book, The Resiliency Advantage, won the Independent Publisher’s 2006 Best Self Help Book Award. 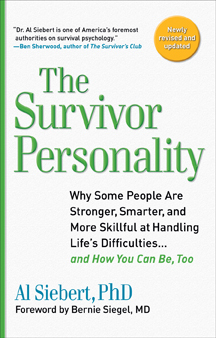 His previous book, the best-selling The Survivor Personality won the USA Book News “Best Books Award Winner” and has been published in German, Dutch, Russian, Hebrew, Chinese, Spanish, United Kingdom, Korean, Romanian, and Japanese editions. Articles quoting his work have appeared in Nation’s Business, Family Circle, Men’s Fitness, The Wall Street Journal, The Los Angeles Times, New Woman, Bottom Line/Personal, Good Housekeeping, USA Weekend, CBSHealthwatch.com, Human Resources Magazine, and many trade publications. His popular quiz "How Resilient Are You?" has been reprinted in many articles and books. He had been interviewed about highly resilient survivors on numerous talks shows including National Public Radio, the NBC Today Show, CNN, and OPRAH. 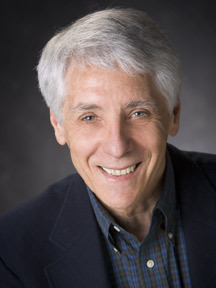 Al Siebert received his MA and PhD in psychology from the University of Michigan. His undergraduate degree was from Willamette University in Salem, Oregon. He taught management psychology at Portland State University for over thirty years while conducting his resiliency research. Al was an ex-paratrooper, was a volunteer recovery group leader with Vietnam veterans, served as chairman of his county school board, and was a consultant to various Native American and Indian tribes. In recent years he gave keynote talks at conferences of the Employee Assistance Society of North America and the federal Office of Personnel Management – Eastern Management Development Center. Al keynoted conferences for many corporations, government agencies, education, and health care groups on "Resiliency in Non-Stop Change." At the time of his death he was a senior consultant to the new "Provider Resiliency Training" program being implemented in all US Army medical installations. Visit AlSiebert.com site to leave a message of remembrance for the family.